Thirteen people have been arrested following a protest by the "Green Brigade" ahead of Saturday's SPL match at Parkhead. A group of around 80 people were halted by Strathclyde Police after a crowd had gathered outside the Chrystal Bell pub in Glasgow's Gallowgate area at around 1pm on Saturday. The Green Brigade, which describes itself as a "a broad front of anti-fascist, anti-racist and anti-sectarian Celtic supporters", had mounted the march over supporters receiving bans and what it described as "harassment by the police". However, police said the demonstration was an "illegal street procession" and around 200 officers were used to disperse the march. 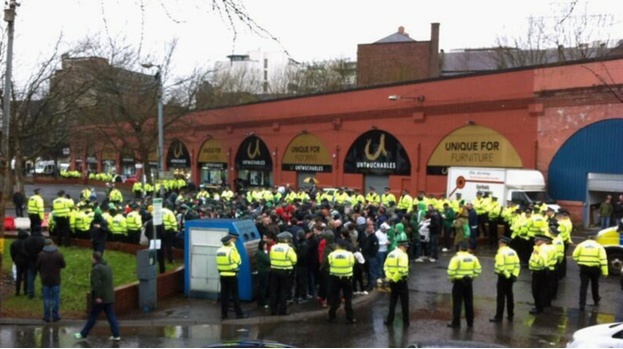 A police spokeswoman said: "The crowd were instructed that any procession on the road was illegal but that officers would facilitate a safe and orderly procession on the pavements toward their intended destination at Celtic Park. "However, this was ignored and more officers were deployed as the crowd became increasingly confrontational and aggressive. The situation was contained a short time later. "Thirteen people have been arrested so far in connection with alleged public order offences, and they are currently being processed. Police enquiries are continuing into the incident and officers will be studying CCTV and helicopter footage." Following the incident, fans took to social media to criticise the police handling of the demonstration which saw a group of supporters prevented from leaving the area by a large number of officers with batons and mounted officers. Before the match, the Green Brigade had said on its website that it would be holding a "corteo to Celtic Park to raise awareness and show support for the growing list of Celtic supporters receiving and facing bans from both the Club and the PF. "It is no secret the level of harrassment many fans receive at the hands of Strathclyde Police nor is Celtic PLCs complicity able to be ignored. As such there is an ever growing list of fans being denied their passion of following their team."